Imagine a group exercise program that’s intense, passionate, and highly focused; that offers elegance, style, and grace; that’s based on flamenco’s festive rhythms; that burns calories and improves coordination and muscle tone all while delivering an incredible amount of fun. That is a short, but accurate, description of Olefit. The program, created by a Spanish company of the same name based in Madrid, consists of five levels of 50-minute classes that increase in intensity and complexity and are regularly refreshed. Instructors and licensed clubs can access new content every three months. Olefit, which is now being rolled out to clubs worldwide, is just one of the many innovative new group exercise and small-group training (SGT) programs that continue to emerge throughout the world, helping to keep members interested, challenged, engaged, and eager to come back to their club. Here, CBI provides a glimpse of novel and promising ways for club members to get their sweat on and for club operators to drive sales, satisfaction, and member retention. Olefit combines flamenco's festive rhythms and fitness. Sporting an attention-getting name, TwerXout combines basic twerking movements—gyrating and thrusting hip movements—with functional training and various dance styles, including Afro, trap, hip-hop, and dancehall. Developed by Kristina Markstetter and Rimma Banina, in Hannover, Germany, TwerXout already has added a new groove to health clubs and dance schools there and is now expanding into other areas of Europe. Capitalizing on the still-growing popularity of high-intensity interval training (HIIT), HIIT the Deck, the newest offering from Escape Fitness, makes use of the company’s versatile Escape Deck 2.0 in step, ramp, and bench modes, along with dumbbells, Bulgarian bags, resistance bands, and more. The sessions integrate cardio, strength, and plyometric movements, and vary in length; and clubs can choose from small-group, large-group, or individual personal-training sessions. AKT is touted to be a "360-degree lifestyle program." Power Plate, the vibrating exercise platform, now offers its portfolio of Power Plate SGT programs at hundreds of clubs worldwide—in the U.S., Canada, South America, the U.K., Europe, Asia, Australia, New Zealand, and elsewhere. The four 30-minute programs include Power Plate X, a boot camp that involves free weights, kettlebells, and suspension training; Power Plate Strong, which is strength training with kettlebells; Power Plate Burn, an HIIT class; and Power Plate Zen, which focuses on yoga, massage, and stretching. Clubs receive 12 weeks of unique workouts for each format, and, every three months, a new 12-week regimen, employing periodization. “Our SGT, which bridges the gap between large classes and one-on-one training, is a tremendous asset to facilities,” says Laura Wilson, the company’s director of education. Power Plate is owned, manufactured, and distributed by Performance Health Systems, LLC, of Northbrook, IL. 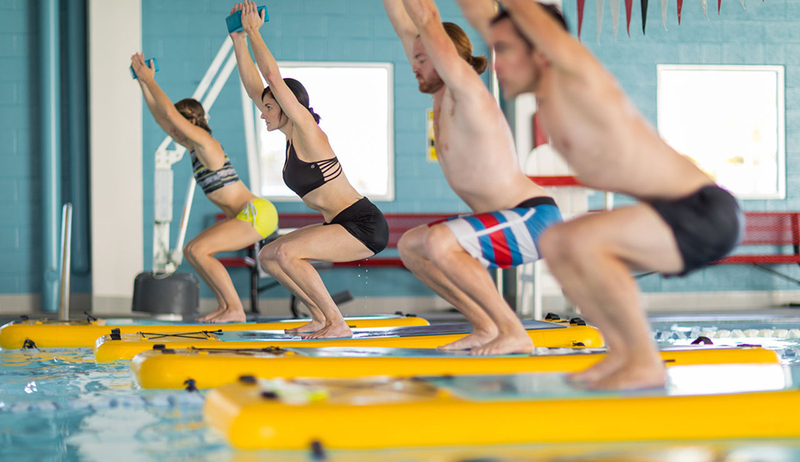 BOGAFIT, a series of functional-training exercises that are performed on the company’s inflatable FITMAT, offers an innovative, engaging, and entertaining way to diversify aquatic workouts. The 45-minute classes, conducted in a pool, are designed to enhance strength, balance, flexibility, and coordination. Students do squats, planks, lunges, strength train, and perform yoga and Pilates moves on the dynamic boards, challenged by the water’s instability, and benefitting from the lower impact it affords. During these high-intensity, universally scalable routines, participants find themselves assuming a wide variety of positions—standing, kneeling, getting down on all fours, and lying down faceup or facedown. BOGAFIT is offered in floating studios worldwide, including ones in the U.S., Canada, the U.K., Western Europe, and China. The company is based in San Clemente, CA. “Clubs need to innovate to remain competitive and relevant to users,” contends Phillip Mills, the managing director of Les Mills International (LMI), the Auckland, New Zealand–based firm that’s known for supercharging group-x classes worldwide. LMI has done its part to help by successfully translating its live classes into LES MILLS Virtual, a digital version. Now, clubs and members can take advantage of an intense, high-energy exercise experience, without an instructor in the room, via an AV system or technology platform that produces cinematic-quality workouts. Nearly all of the company’s signature programs—from BODYPUMP to LES MILLS BARRE—are available. They’re filmed at large live events with five to 10 cameras, so in-studio exercisers also enjoy the excitement of the crowd. CardioWave helps improve balance and strength. The bootybarre method, which originated in Los Angeles, now offers bootybarre BOUNCE, a unique fusion routine that makes unexpected use of a JumpSport Fitness trampoline with an attached ballet barre. A blend of cardio, dance, yoga, and Pilates, these brand-new classes employ bouncing cardio moves and barre sculpting exercises to provide total-body workouts that tone the body, improve balance, build endurance, and increase circulation. “Adding a barre to the trampoline delivers versatility and safety in this high-intensity, low-impact class that combines cardio and strength, and is easy on the joints,” says Tracey Mallett, the founder of bootybarre and creator of bootybarre BOUNCE. XBT is a versatile exercise tool that serves as the basis for XBT SPEED group classes, which are now being offered throughout Europe. The tool is composed of a comfortable belt, two cable pulls with steel springs, and hand and foot loops. Users attach the cables to their hands and feet, and, during exercise, must overcome the spring’s resistance, which is adjustable for everyone from beginners to elite athletes. The 30-minute classes integrate martial arts, functional training, and HIIT, with participants punching, jumping, kicking, squatting, lunging, and more, to improve their strength, agility, speed, and endurance. XBT SPEED was developed at the Do-It-Academy, in Weingarten, Germany, which was founded in 2016 by supercoach Klaus Kirsch, who also helped invent the XBT. XBT SPEED uses resistance to get more from a workout. The exclusive AKT program, developed by celebrity trainer Anna Kaiser, has already yielded studios in New York City, the Hamptons, Connecticut, and Los Angeles, and is now poised for franchising. The regimen, which has attracted the interest of entertainers such as Shakira, Kelly Ripa, and Karlie Kloss, is a “360-degree lifestyle program” that combines dance and functional training via a customized mixture of four core modalities—dance, toning, interval training, and circuit training. The classes, which last from 45 to 75 minutes, make use of elements of strength, yoga, Pilates, and HIIT, and change every two to three weeks to keep exercisers from plateauing. AKT is part of Xponential Fitness, based in Costa Mesa, CA, whose other brands include CycleBar and Club Pilates. “We’ll expand Anna’s ultra-popular brand through franchising, and bring its one-of-a-kind workouts to the masses,” says Anthony Geisler, the CEO of Xponential Fitness. As suspension training continues to attract fans worldwide, TRX Team Programming continues to develop and introduce premium new workout experiences. Among its current roster of group training offerings are TRX Strong, which emphasizes bodyweight exercises; TRX FIT, for HIIT-style workouts; and TRX Yoga Flow, which combines suspension training and power yoga poses to increase strength and flexibility. TRX also offers circuit routines that employ its suspension trainers, RIP trainers, and other accessories. “We work with customers to identify what they want to accomplish in their functional-training areas, and then provide education and ongoing programming support for success,” says Nick Vay, the senior director of North American Sales at TRX, which is based in San Francisco. A non-dance, boot camp-style workout, STRONG by Zumba capitalizes on Zumba’s renowned ability to get people moving. One of the company’s newest offerings, these HIIT routines combine cardio, bodyweight, muscle conditioning, and plyometric moves. They’re synced to custom music, created by award-winning artists, that’s been reverse-engineered to match every move precisely. “This new concept, where music is the main motivator, allows exercisers to burn more calories while toning the abs, legs, arms, and glutes,” says Alberto Perlman, the CEO of Zumba Fitness, based in Hallandale, FL. Similar to BOGAFIT, CardioWave, a program developed by GlideFIT, a Salt Lake City, UT–based firm, is conducted in a pool on that company’s aquatic stability board. The one-hour workout entails movements such as crunches, burpees, push-ups, mountain climbers, and moving squats and planks that generate serious waves. CardioWave, which takes advantage of the board’s unstable surface and of water’s low-impact resistance, is designed to increase strength, balance, and flexibility faster than land-based exercises. CardioWave is currently available at health clubs in the U.S., Spain, Singapore, and New Zealand.